I live in Pensacola, FL but I am willing to go as far west as Mobile, AL, east to Destin, FL and north to Montgomery, AL as well as anywhere in between. I work on a reward basis, that means you pay me what it's worth to you and what you can afford for me to come out and find your lost item. We can discuss it further when you call. If your search requires me to dive, please contact me to discuss the cost for this specialty search. I have a top of the line land machine as well as an amazing saltwater machine that lets me find your item on the beach or in the surf. In addition, I have been diving for 25 years and my machine allows me to find your item in much deeper water. I am 44 years old and have a wife and two kids. I have lived in Pensacola for 33 years. I first became fascinated with metal detecting as a kid when I helped my grandmother dig up an old hotel door lost in a hurricane that she located using an old Radio Shack detector on the beach. By the time we id'd it we had so many people watching and the paper even took her picture. It was so exciting and that got me hooked. Since then I have much better equipment and have learned quite a few techniques but each target is still just as exciting. At the end of the day I joined Ringfinders because there is no better feeling than finding something for someone they thought was lost forever. This guy is amazing! We had to call him out to our condo on Tuesday night. I lost both my wedding ring and anniversary rings at the beach. Lost them sometime around 11am and didn’t realize it until 6pm. I had taken them off to put lotion on and tucked them “safely” into my swimsuit skirt fold. Totally forgot about them and stood up at various times. The amount of sadness and panic I felt was overwhelming. By the Grace of God we found Dave and he came out that night and found them right away. So eternally grateful to him and his lovely wife. From the first phone call and several texts that followed he was very nice and tried to calm my anxiety (it was very high) and reassured me it should be an easy find. Thanks be to God he was 100% right. The flood of emotions were overwhelming at times. Thank you again Dave! You are an angel. To say that Dave is a miracle worker is an understatement. After my wife lost her ring just off shore we spent the rest of the trip watching as group after group of fellow vacationers flooded the beach and waded in the area where she lost it. Some with nets looking for shells or fish and others stomping around and pressing the ring further into the sand. And any time someone looked excited, I was wondering if they had found it with me never knowing. I had never heard of theringfinders.com, and didn’t find it until after we had been home for days. I sent him an email, and the rest is history. It is an unbelievable feeling to have it back after thinking it was lost to the sea forever. We had come to terms with it, but we’re astonished and amazed that he was able to recover it, and do it so quickly after us trying so long with goggles to no avail. 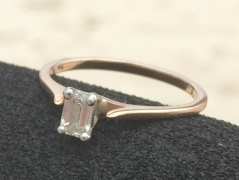 My wife is planning to wear a fake ring for future beach trips, but we have an awesome resource up our sleave if we ever lose anything again, and I won’t wait 9 days next time, hehe. I can only say I could not ask for a better end to a situation I’d almost walked away from. After dropping the ring and the immediate search around my feet, I found a line reference on shore and began shuffling my feet hoping for the million to one chance of touching it…no luck. I explained to Ami that we were standing on top of it, that the density of gold took it to the bottom and the shape trapped enough sand that it was completely covered within seconds. After an hour of looking (36″ of water), I’d written off finding it. 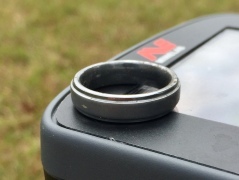 Being a land detectorist and a diver, I’d on several occasions considered purchasing an underwater machine and even suggested to Ami in the heat of the search that I should go ahead and buy one to retrieve my ring. We went about our day, down on the loss. That evening, Ami found Dave via an internet search and made contact. He responded Saturday evening and we returned an email Sunday morning, learning that he had already packed and was eager to help us. We were disappointed when Jeannie text us that he’d pulled a muscle, but gave him our best and checked out of the hotel. We were about to enter the Peg Leg’s for lunch when we got the call that he was better and enroute. When we got back to the hotel, Dave was already preparing to enter the water based on the references I’d given him. He gridded the area and in no time offered me the honors of scooping it up. All I can say is ‘Thank you very much’ for your retrieval efforts and returning the ring my wife put on my finger 16 years ago. It was a pleasure to meet both you and Jeannie and wish you both the best. Dave, thanks again for coming all the way from Pensacola (out of your typical range) to find my ring! This ring has nine lives, as I told you I lost it in the snow once before. Still can’t believe you found it in less than 5minutes after it was in the ocean for 4 days. Very impressive! You provide a wonderful service and I have a great story to tell for years. Thanks again! Thank you again so much Dave for not giving up. I was so upset and sick that I had lost one of my most precious material items. I’m grateful that a friend Justin Harbin was kind enough to send me ur info. I’m very pleased with ur effort to find my ring and not give up. I’ll always be grateful for you and ur wife for this. May God bless you and your family. My day was definitely made when u made that last call to me that you needed to find my location to put this precious jewel Bk on my finger. Thank you so much to Dave and his wife for coming out and finding our ring!! It was such a simple process and he was so gracious. After searching for hours, Dave found it within minutes!! It really did save our trip. Thanks again to Dave and the ringfinders. 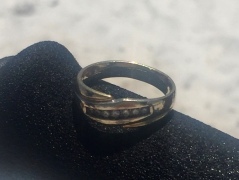 While on a beach vacation during 6/8 through 6/16 at Orange Beach, I lost my David Yurman ring my husband gave me as a gift. I was devastated. It’s a ring that is not too big so I was really baffled as to how it fell off. My family and I searched for the ring in the sand which seemed impossible even with 3 strainers from the condo’s kitchen! I searched the internet and came across Dave Cartee’s website. I called him first thing the next morning. He return my call right away! He was very polite, friendly and professional! He has such a calm demeanor that it gave me such high hopes. He searched the areas with a very tight grid. He didn’t find my ring. But after his very thorough search, he told me “your ring is not here. It’s not on this beach. It’s not in the areas you asked me to searched. I hope you have an ending to this story with you finding it in your condo because I can guarantee it’s not here on this beach”. I was a bit sad but very confident that his search was true and accurate. My sisters and I prayed about my lost ring and we continued on with our fun vacation. Dave even provided a letter to be submitted to my insurance company in order to file a lost claim. Even after meeting him, Dave stayed in touch with me as I continued to text him about another guy searching the same exact area with a metal detector! 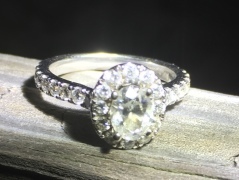 Once again, he said with much confidence, “Loretta, he is not going to find your ring because it’s not there.” I wanted to know all about his 2nd searcher who we watched from our balcony. We later learned the couple sitting near us saw a guy with a metal detector and asked him to search the area for us. 3 days later my sister decides to clean her beach bag out and what does she find...my dern ring!!! I didn’t go into my sisters’ beach bags. So it’s still a mystery how that ring fell off into her bag because I don’t take my rings off at the beach. I did move her bag when we decided to move our beach tents. We jumped for joy and shred some tears! I immediately text Dave a picture and said, “we found it.” Once again, as calm as before, I can imagine him saying exactly what he said days earlier “it’s not on this beach, I hope you have a story where you find it in the condo.” That is just what happened! Although he did not find my ring, he still gave good karma! I would call him all over again. I surely highly recommend his service. It was a blessing to meet such a nice man who does these searches just to bring smiles to his customers faces. Thank you Dave for being so confident and for all that you do! Keep searching! Dave reading this post made me cry! Words can’t describe the joy I felt when you walked up with my ring on your pinky. I have stared at it for the last two days thanking the Lord for ordering our footsteps and putting you in our path. You have a gift. If possible I cherish my ring more now! Thank you so much. I will never forget it. I wanted to thank you again for going the extra mile looking for my “diamond in a haystack” this past week. I would like for folks that are considering giving you a call to have one more vote of confidence that you were extremely helpful, honest, and professional. Even if you didn’t find my impossible-to-find diamond stud earring with virtually no metal on it. I appreciate how quickly you answered my call, did extra research on the type of jewelry I lost in 7 feet of salt water, and spent an hour and a half looking for something you carefully prepared me not to expect to find. It is so much easier knowing that a real effort was made. Thank you. A FOR EFFORT! Dave has truly, God given talent! I’m so thankful that God placed in him our path. 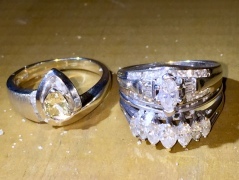 I never doubted that I could trust him or that he would not be able to do his very best to return my wedding rings. If anyone ever goes through what we did (I pray that they do not ) please do not hesitate to call Dave. He gave me reassurance that he would try his very best to return my wedding rings!!! Thank you so much Dave!! The reality is that we had given up a year and a half ago after an extensive three day search that yielded no results, so to think that Dave Cartee would just show up, look for a few minutes, and find it buried 3-4″ in the ground with grass growing right over the top of it was utterly unthinkable, but my original wedding band had so much sentimental value that when we heard about Dave we had to at least give it one more shot before accepting the likelihood that we would never get it back. We couldn’t be more glad that a friend told us about Dave, and we are honored to get to share our incredible experience with others knowing what a relief it is not to have to settle for defeat when something irreplaceable is lost. You couldn’t ask for a more equipped or genuinely caring guy to help you hunt for your lost treasure–it seems to me Dave makes this service available primarily simply for the thrill of the hunt and for the joy he is able to bring to others. His passion for finding what is lost is obvious and contagious–you can’t give up if Dave is looking, he won’t give up, and he won’t let you until the thing is found. Thanks for providing us with a miracle moment, Dave, we will never forget it or you! Dave was absolutely amazing! 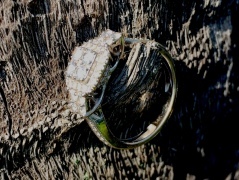 When I lost my ring I thought it was gone forever and I’m so glad that my boyfriend called him. 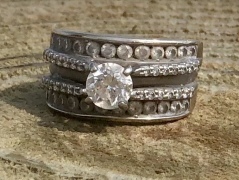 His customer service was amazing, and so was his ring finding! We searched for hours the day before and had no luck and he came and found it within two minutes! I’m so thankful we called him and if you ever lose a ring definitely call him. My family recently went to watch the sunset at Pensacola Beach. 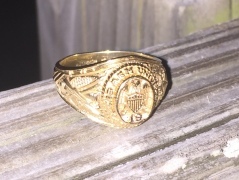 About 30 minutes before sunset, I lost my Aggie Ring in the sand. After searching for almost 30 minutes, my mom and I decided to go buy a metal detector to see if we could come back and find it. After checking multiple stores for metal detectors and not finding any, my sister came across Dave Cartee’s website and sent us the link. We called him around 7:30, and with no hesitation he agreed to come out and find it for us. He even told us he’d have it within an hour. By the time we were able to meet Dave at the beach, it was pitch black and freezing cold. We told him the general area where I had dropped it, and he searched with his metal detector for a few minutes. 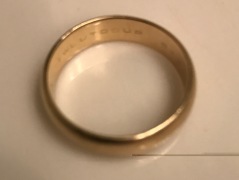 Just when my mom and I were starting to doubt that we had remembered the right location, he dug up a pile of sand, sifted through it, and pulled out the ring. And it only took him about 10 minutes! I am so thankful that Dave was willing to come out at night and in the cold. I thought I had lost my ring forever, but he found it no problem. If you ever lose a ring in the Pensacola area, don’t hesitate to give him a call! To say that I am grateful to have met Dave Cartee, would be the understatement of the year, or maybe the last 17 years to be exact. 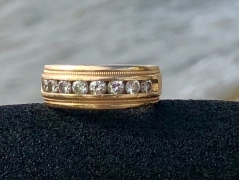 After spending a wonderful week with my wife and daughters on the beach in Perdido Key, Florida, you can imagine the sheer terror when I walked out of the Gulf on our last day there only to find that my wedding band was missing. It was a truly helpless feeling. Before going to dinner that night, I searched the Internet for stories about other guys who maybe had lost their wedding bands. It was just an effort to try to make me feel better. While doing the search, I ran on to theringfinders.com. It was there I met my new friend Dave. He listened to my story and instantly put me at ease. He gave me confidence that there was really a good chance he thought he could find my ring. Despite recently having had surgery, he still made himself available to try to help me out. 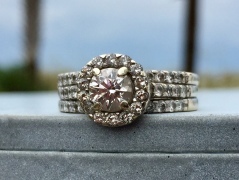 You can imagine the sheer joy we experienced, while driving back to Illinois, in receiving the phone call that he had found my wedding band. It was truly a miracle! I have since told many people this story and they find it almost unbelievable. I would strongly recommend Dave and I am so pleased that there is an organization out there like theringfinders.com to help people in a truly desperate moment. I will be forever grateful. Thank you Dave and Cale! I was on vacation with my family in orange beach. We were playing football in the surf (and I made the mistake of not taking my wedding ring off) it popped right off into the water. We searched for roughly an hour to no prevail. 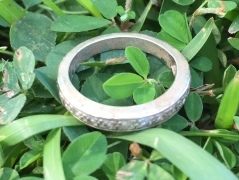 I had read on Reddit awhile back about people who specifically look for lost jewelry, but never thought that I would need it. I wasn't sure it was possible since it was "in the surf". So I googled and gave Dave a call (since he was the only one who appeared to have an "aquatic" metal detector) thinking it was a HUGE long shot. Well Dave, and his son Cale, came to the rescue. When he answered the phone I was trying to explain how I didn't think it was findable/possible and thanks for his time, but he assured me that he WOULD find it, and to relax. Dave and Cale came out and found it in about 30 minutes! I was in shock, and so was everyone else on the beach! Dave and Cale I can't thank y'all enough! Not only are these guys selfless, but some of the nicest (most confident) people I have EVER met. If you don't think it's possible to find your lost ring (like me) Dave and Cale will make you a believer! I know this might sound like a infomercial, but it was Utterly amazing! Thanks Dave! and Tell Cale I said he's the man! Just want to say thanks to Dave for helping us out. 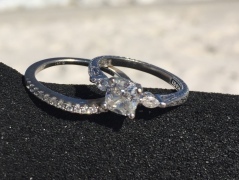 We think my wife’s ring fell off in the ocean. At the time we combed the beach as best as we could. We left Perdido Key with out the ring. When we got back I did some searching online, found The Ring Finders, and decided to give Dave a call. He was friendly and very generous with his time. He took a detailed account of our story. That day he was out in search for it but unfortunately was unable to find it. We feel between the tides and storms, the ring was no longer remotely close to where we had been. I wish we would have called him sooner and likely would have had a different outcome. So if you have lost a ring and are in the Pensacola area, give Dave a call ASAP! 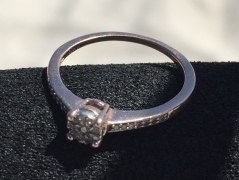 Thanks so much for your time and help in finding my wedding ring which I now understand was your first official find. My wife and I were in Pensacola for a week of fun and beach time with some friends. 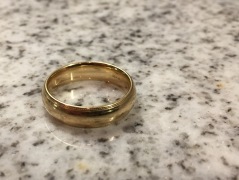 While swimming out in the gulf in about chest deep water I made the comment to a friend Tim that my wedding ring was really tight on my finger. I was attempting to pull the ring over my knuckle when I dropped the ring in the water. We looked for the ring for some time, but to no avail. Tim went to get some goggles and I gave some strict instructions not to tell Julie, but of course as soon as she saw Tim getting the goggles she began to ask what are y’all looking for. 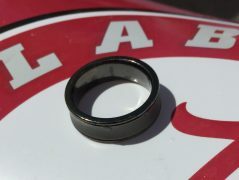 After some more searching and no luck finding the ring I had to confess that I had lost my wedding ring. After several hours I walked over to our RV to check on the dog. While I was gone Tim noticed a man out in the water with a metal detector he approaches the gentleman and explains that a friend had lost my wedding ring earlier in the day. That man was Dave Cartee. Dave tells Tim that he is with TheRingFinders and that he “WILL find my ring”. Tim shows Dave where we were in the water and tells him that some 4 or 5 hours have passed. Dave goes out into the water, searches and locates my wedding ring. Thanks so very much for taking the time and for being our hero that day. Dave tells us that “every ring has a story and when a ring is lost the story stops it his mission to locate the ring so the story can continue”.